This month we have a special movie presentation. Fasten your seatbelt for The Road to Monterey. It’s not just a film about racing. It’s a film about passion. It’s a film about one man’s vision. 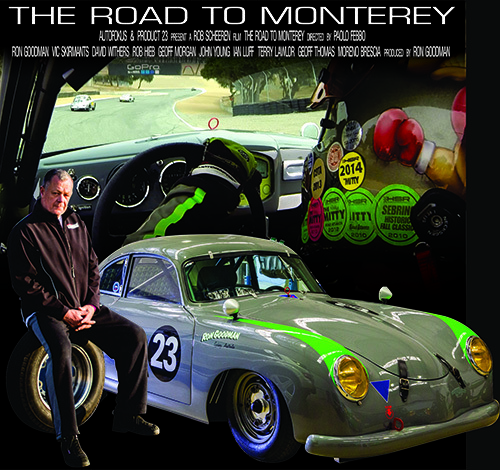 The Road to Monterey traces Sydneysider Ron Goodman’s dream of taking his 1954 Porsche to race at the Rolex Monterey Motorsports Reunion, America’s holy grail of historic racing. We follow the twist and turns along the way. At a troubled visit to Indianapolis early in 2014, Ron proves his speed before a frightening high-speed accident brings his weekend to a sudden end. We experience Ron’s frustration when his beloved grey Porsche 356 coupe is delayed in transit to America. And his overwhelming relief when the car is finally delivered to the raceway with a mere 12 hours to spare. Cinematographer Rob Scheeren has captured this incredible journey from the inside, spending countless hours with Ron, his team and legion of supporters for a unique view of an amazing adventure. Please register here for this event so we have an idea of numbers as space will be limited. There will now be 100 chairs kindly supplied by PCSS so there will be seating for the first 100 registrants.